With a gunfight outside and the sound of explosions, some serious kung-fu going on while some of the team are trying to grab a strange artefact from a temple wall, this episode feels like a mishmash of The A-Team and Indiana Jones going on. And, while it is obviously tied into the wider Marvel universe, there are elements of Agents that makes it feel like it belongs to an older style of television and that isn't a bad thing. I have to be honest, the second episode isn't as good as the pilot, especially as the episode goes on it begins to show some of the points it will have to work on if it is to improve. One of these problems surround the characters of Fitz and Simmons. They were the least developed characters in the pilot episode and, while they do get a little exploration here, they still feel like the same sort of character. Apart from the fact that Simmons is a little sunnier than Fitz, they still sound like it each. I know they are supposed to that but it doesn't help them in coming into their own characters. Another problem is that the humour can sometimes be a little hit and miss. Most of the characters get a lot of quips while not necessarily quick witted. In fact, it is only Melinda May, a character is isn't outwardly happy who gets the funniest moment when she tells her group that they talk too much. Oh, and when she breaks her wrists to get out the rope that is tied to her is pretty amusing too. But one thing that was good about this episode was that it became apparent just how self aware this series is. Coulson gets told off numerous times for having a team of younger people around him while the baddie Camilla, tells him he is in the middle of a mid-life crisis. This came after a lot of internet users complained about the young cast. Nevertheless those young cast members are making the series work, take that moaning internet people! Camilla was another problem that this episode faced, she is fairly pedestrian in terms of her characterisation. It was nice however to meet someone from Coulson's past and we get to know a little more about him before he helped to form The Avengers. But it was nice to see more of his collectables collection. What was also nice to see was more ties to the wider Marvel Universe. Here the device they were after belonged to Hydra, a possible nod to future stories, and mentions of Thor and Iron Man. While the Thor mentions could be a little much sometimes it is good to see the show isn't afraid to tell us what it as a small part off. And to help this point along, we get a little Nick Fury cameo curtesy of actor Samuel L. Jackson who informs Coulson that Skye is a risk. Speaking of Skye it was shock to discover that was something of a double agent. But her confliction about it was a little worrying, if she is this concerned about betraying her team now, then surely there can't be anywhere the character can go in terms of her development. Don't set my words in stone here, I'll be very interested to see how she develops in future episodes. 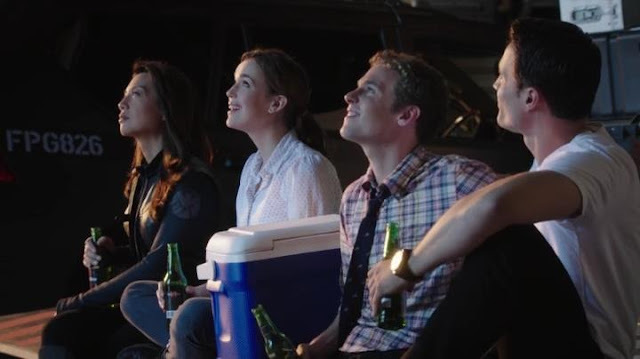 Another nod to future episodes comes in Coulson's mentioning of Tahiti, describing it as a magical place, it is beginning to come across as something that should be worrying that pleasant. It leads the series into a new story arc though, just what the hell was Tahiti and what did Coulson have to do with it?